The Trait Tree is one of the displays accompanying the Genome: Unlocking Life's Code exhibit at the Rochester Art Center from June 23 to Sept. 21. Step up to the kiosk and answer four questions about your appearance - what is the shape of your hairline, do you have dimples, do your ears lay flat or not, and can you roll your tongue? Your answers to these Trait Tree questions at the “Genome: Unlocking Life’s Code” exhibit will reveal information about how you are uniquely made. 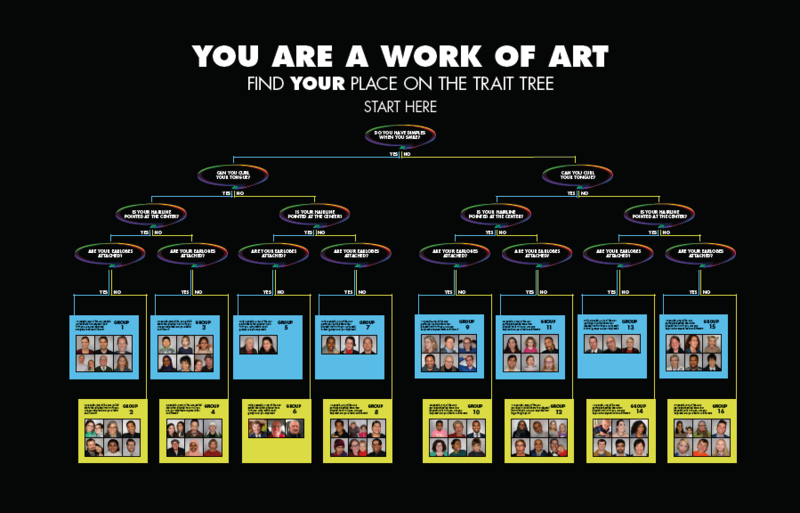 See where you fit on the Trait Tree, a large wall display that shows how four genetic traits can lead to 16 different combinations of physical characteristics. The display is one of the innovative, hands on activities at the exhibit at the Rochester Art Center (RAC) from June 23-Sept. 21, in Rochester, Minnesota. Your genes are like your unique molecular fingerprint. The genome exhibit is designed to help you understand your genetic profile and the complete set of instructions it gives to help your body grow and function. You may learn how inherited traits affect your life and your health. There’s more than just hands on learning. On various days, Mayo Clinic experts will lead “RAC chats” - discussions of topics in genomic medicine, such as how the bacteria in and on your body (your microbiome) are connected to your health. Do you like to read? You can participate in a book club discussion on The Story Within by Amy Boesky. View inspiring art exhibits like Positive Exposure – The Spirit of Difference, a series of photographs by artist Rick Guidotti that seek to show the beauty of all people by photographing those living with genetic conditions. These are a sampling of the activities you can enjoy when visiting the “Genome: Unlocking Life’s Code” exhibit. Learn more about the exhibit here. See the schedule of events for dates and times. “Genome: Unlocking Life’s Code” was developed by the Smithsonian Institution and the National Institutes of Health’s National Human Genome Research Institute. It is made possible in part by support from the Foundation for the National Institutes of Health.